If you’ve made the effort to come all the way to Rhynie, it would be rude not to find out more about the area surrounding my field and the other symbol stones. 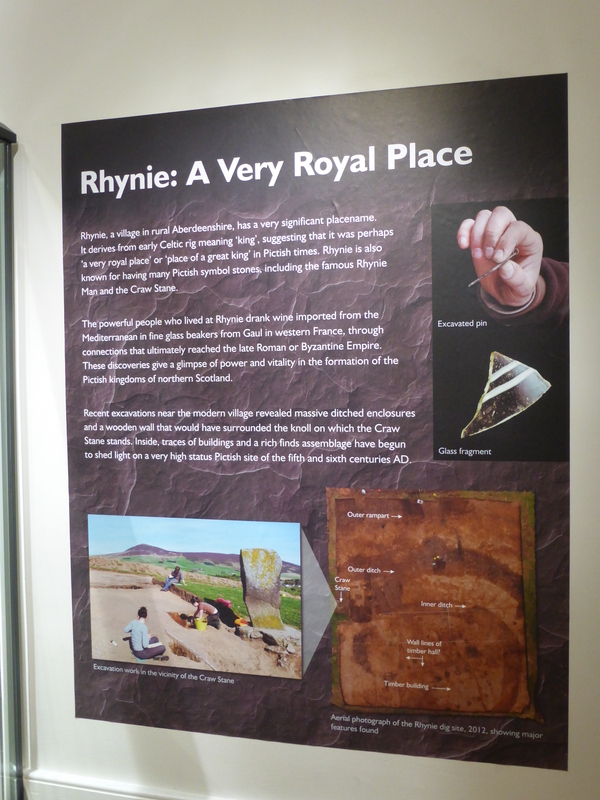 Rhynie is situated in the AB54 postal area in the far north west of Aberdeenshire, it is a place with a deep history: from the earliest geological evidence of cellular plants 410million years ago, to evidence of a long history of human habitation ranging back to the Neolithic Period (4000 – 2500BC). Traces of human habitation are found in the area’s recumbent stone circles, standing stones, Roman battles, Pictish symbol stones, churches, castles, architecture, beautiful natural history and evidence of pre ‘improvement’ features in the landscape. 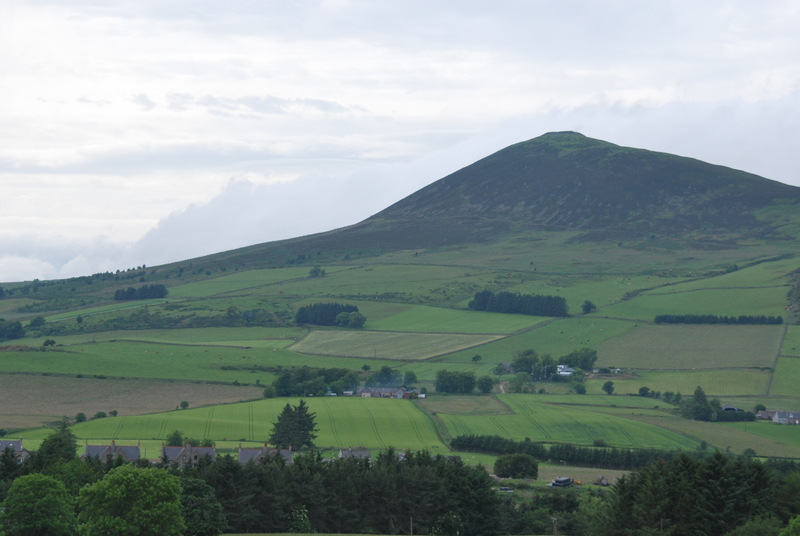 This area of Aberdeenshire lies adjacent to the Moray region, part of Highlands and Islands and out with the highly supported and promoted areas of the Cairngorm National Park, Deeside, Whisky and Victoria Tourist Trails. The area offers the visitor and community an amazing place to live and work. There are a whisky distilleries, added value food producers, the spiritual home of the Gordon Highlanders, a car club, train and transport links, hundreds of social groups and clubs and an interesting cultural corridor that runs from North to South of the area. Employment is mainly dominated by Forestry, Agriculture and public services and a growing number of creative industries. However, accommodation is in short supply, which can lead to higher prices and with few new houses being built it is thought that the lack of growing communities is restricting the further enhancement and development of the area. Around the time of Culloden, during the early part of the Industrial Revolution, Huntly (the area’s market and administrative town) was at the center of weaving and spinning and was responsible for a third of linen production in Scotland. However with the introduction of cotton from America and the Napoleonic Wars, the areas importance declined. Despite this change in fortune Huntly and its districts thrived and supported by the train network was a thriving centre for leather, cloth, machine works, beer, sport and fashion which attracted the fashionable, intellectual and philanthropic. 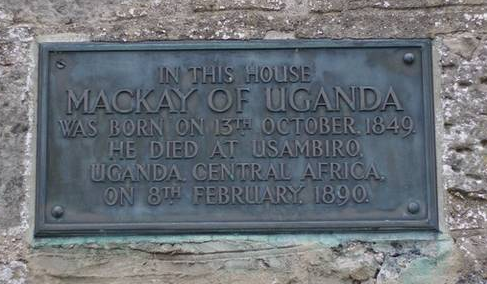 The patrons who grew the town and its wide range of schools and community groups also travelled throughout the world; taking newspapers to China, music and literature to the heart of academia and missionaries and engineers to the ‘developing’ world. 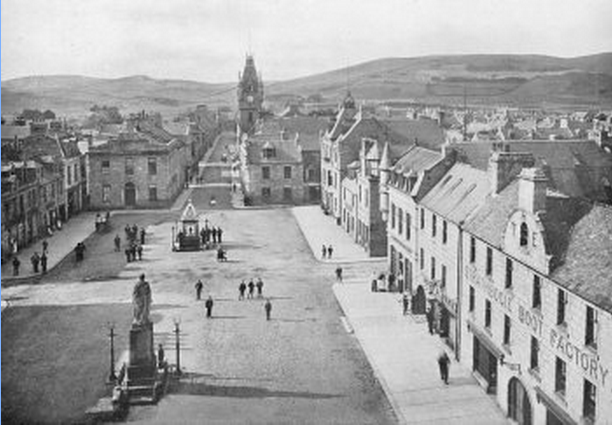 Huntly in the 19th Century, looking towards the Clachmach and Rhynie 9 miles to the south. Since the 1980s and the closure of a few major employers in the area AB54 is in a transition period; shops are closing and the town and surrounding district is dominated by two large supermarkets, charity and empty shops, a shortage of housing, properties that require investment and a closed museum. Tourism is slowly taking hold with a wide range of outdoor sporting facilities, fishing, wedding venues, estate activities and Huntly Castle, however visitors are generally bussed in and out spending little time in the surrounding villages or town. Without facilities, available houses and reasons to attract people to the area, there is little to encourage new people to gaze, linger and share their experience of the AB54 area with the outside world. Wolfstone (http://canmore.org.uk/site/18163/newbigging-leslie) found at Newbigging Farm, Leslie now installed at Leith Hall, 4 miles from Rhynie. Despite the economic and geographical challenges, the area’s rich history, sporting and cultural facilities, train links and community participation all present opportunities for the future of the AB54 area. It is becoming increasingly apparent that the AB54 area has a lot to offer the visitor and community and perhaps it should be promoted more widely. 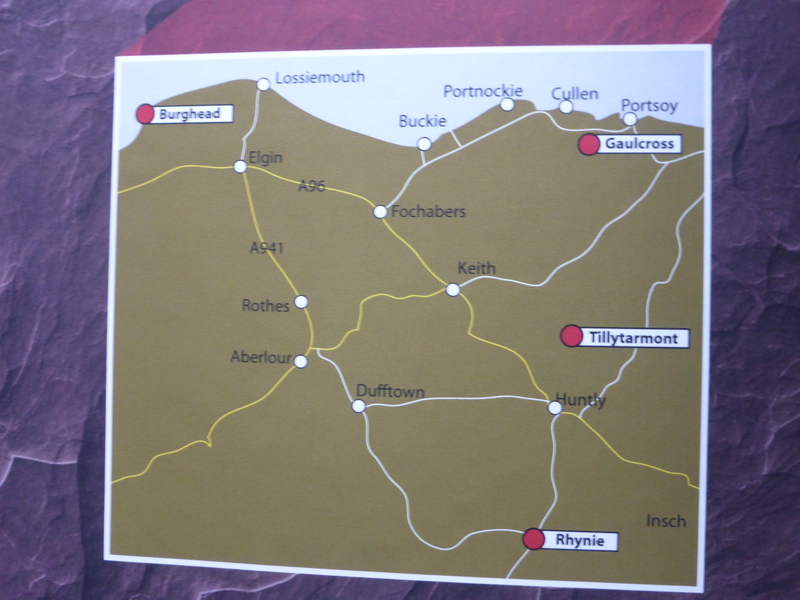 With the range and diversity of history, natural resources and outdoor facilities Rhynie and AB54 have a lot of potential, which could help develop and sustain the area now and into the future. I want to return and would love if you came and visited as well. 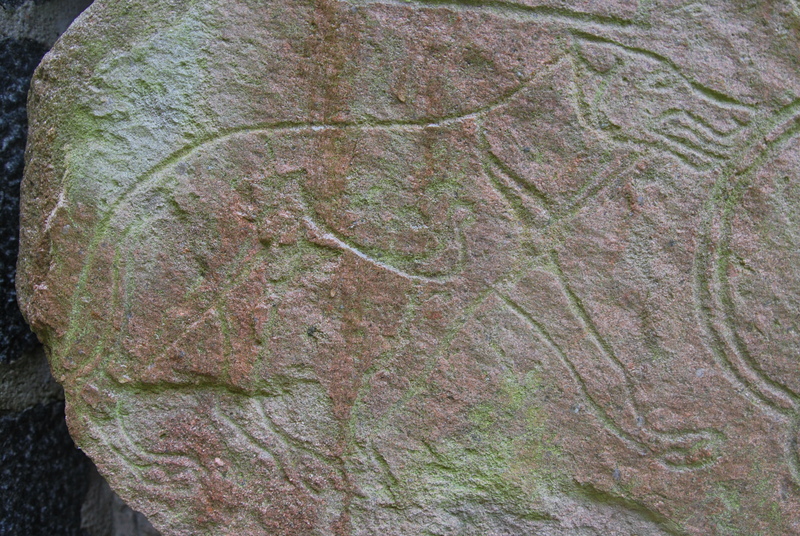 Rhynie Chert was found in Windyfield at the base of Tap o’ Noth on the outskirts of Rhynie dating back to 400 – 412Million years ago. 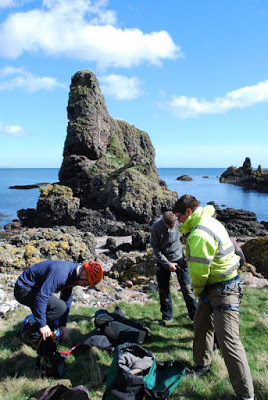 For more information take a look at the Rhynie Chert Learning Resource Site http://www.abdn.ac.uk/rhynie/. The Chert is one of Rhynie’s many interesting geological features. A quote from a discussion with Jason Williamson, Exhibitions Manager at Aberdeen Art Gallery and Museums. He was referring to Deveron Arts in Huntly, Rhynie Woman in Rhynie and Scottish Sculpture Workshop in Lumsden.